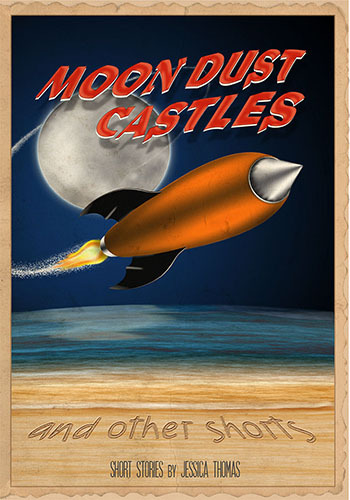 Moon Dust Castles (and other shorts) is a short collection of short stories that promises short bursts of laughter and long guffaws. The cast of characters includes a drengle whose InstaVoice is on the fritz, a gnobbin determined to redeem his home country of Effnshrmrmr from the prevailing darkness, and a reality TV star intent on winning permanent lunar residency. Imbued with a fresh lack of profundity, doused in satire, and sprinkled with whimsy, these stories will gently offend end-times prophesiers, fantasy groupies, and anyone who thinks humans actually have a clue. With bits of science fiction and romance in the mix, this collection offers a hearty taste of Jessica Thomas’ rich (and sometimes bitter) imagination. Jessica E. Thomas became fascinated with the somewhat strange and slightly askew at an early age while watching television shows like The Twilight Zone and Tales from the Darkside, and while reading literature such as Shel Silverstein’s Where the Sidewalk Ends. She wrote her first poetry book at age eight and continued writing poetry throughout her tweens and teens, convinced it would prepare her to write the Great American Novel. In her early twenties, with English degree in hand, she entered the real world where the job of spinning a dull yarn was surprisingly underappreciated as well as undercompensated. Determined to eat, she entered the professional world of Marketing in 1997 and later transitioned to Information Technology. Since 2001, she has worked in the pharmaceutical, student loan, and defense financing industries as a computer programmer, systems analyst, Web developer, and technical writer. Despite spending most of her time talking to computers, she continues to write for human audiences as well.